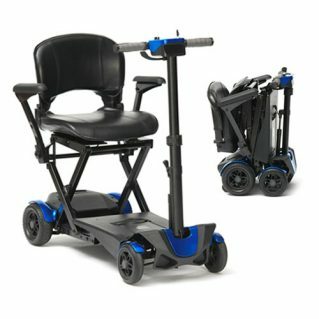 The Little Star is a compact, yet feisty 4 wheel lightweight mobility scooter that’s very easy to manoeuvre around the home or shopping centres. The lightweight and compact size makes it very portable by car. Simple to operate, with finger control levers, the Little Star can travel up to a speed of 4mph and achieve a distance of up to 8 miles between charges. Despite it’s simplicity, the Little Star comes with a complement of practical features such as an ergonomically designed hand wheel for tiller adjustment, a padded seat and flip back armrests to make access easy. It can also be quickly folded down for storage.